Daily Fantasy Sports Simplified. No Drafts, No Roster, Fast DFS. SwiftPicks is the fastest and fairest way to play Daily Fantasy Sports (DFS). Our mission is to provide a stable platform that provides more opportunities for the typical player to win money over time. Players compete against similarly ranked players throughout various competition styles. This removes the headache and stress of playing against dominant players that might have a competitive edge due to their level of knowledge in statistics and algorithms. Based on a scoring system and a prearranged set of players, the objective is to choose which athletes will accumulate the highest amount of fantasy points. comfortable with. You will be matched against peers that have a similar SwiftPicks rank. Take a quick 30-seconds out of your day and pick who you think will have more fantasy points. It’s easy! Simply tap the player of your choice. Watch the games and root for your players. Check your score with our live points updater and whoever scores more points, wins! It’s simple! You select which player from each category that you think will perform the best. The roster is predetermined, and the same list is given to each user. This provides a fair and equal opportunity for every contestant. After your lineup has been set, you then select which contest pool you would like to enter. What makes SwiftPicks different from other DFS sites? SwiftPicks provides the solutions to many of the issues that arose from the success of other DFS sites. 1. Competition: SwiftPicks uses a player ranking system to evenly match players against their competitive peers. This eliminates the problem of player targeting. 2. Time: There’s nothing better than making money in the shortest amount of time. With SwiftPicks you can choose your lineup in less than a minute. 3. Win Rate: One of the biggest issues with other DFS sites is the win percentage per player. The typical player cannot spend hours upon hours researching every game and player to find the most optimal setup. With player matchups equivalent to their skill ranking, SwiftPicks provides the opportunity for every player to be a winner more often than other platforms. What are the different deposit methods? What is the minimum? How will I receive my withdrawals? What is the minimum limit? Withdrawals are processed through PayPal, cryptocurrency (Bitcoin or Ethereum only), or requesting a check. The minimum withdrawal limit is $25. Approval of your withdrawal request can take up to 24 hours (1 day), but in most cases it is less. How do I select my lineup? After you have registered for an account, click on “Create Lineup” to start making your team. Choose 1 player from each selected category until you have all positions filled with an athlete. Can I create multiple lineups? Yes, you can create as many lineups for that day as you wish. 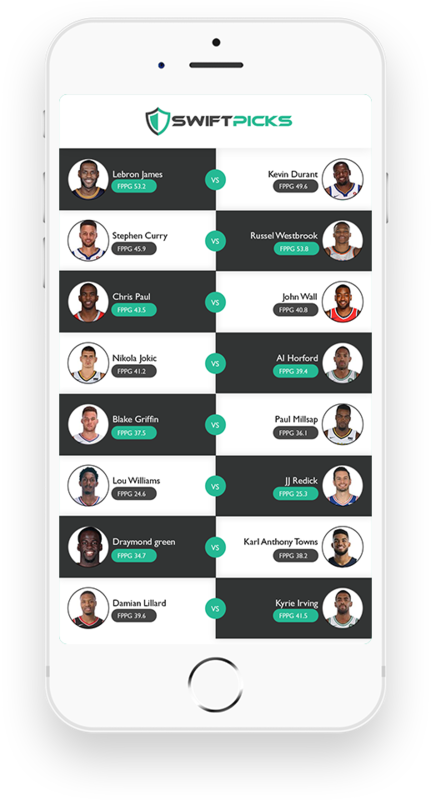 After creating your lineup, the application will save it for future use. If you choose to enter multiple contests, you will then add the preselected team you made into each contest. Can I join multiple contests? Can I use a different lineup for each? Yes, you may enter multiple contests and use different lineups for each entry. Examples: You may create 10 different lineups and enter them all into a $1 contest. You will have 10 different matchups with 10 different lineups and the total entry fee is $10. You create 5 different lineups and enter each unique lineup into 5 separate contests ($1, $2, $5, $10, $25). You create 1 lineup and enter it 10 times into a $1 contest. You will be matched against 10 different opponents and use the same lineup for each one. Your total entry fee is $10. What happens in the event of a tie? If there is a tie in a head-to-head competition, both parties will be refunded their full entry fee. Can I change or cancel my lineup after it has been submitted into a contest? You may change your lineup up until the start of the first game. You may not cancel your contest entry once it has been submitted. What happens if a player is injured or not playing at the last minute? If the player you selected opts to not play, an alternate of equal status will automatically replace your current player. You are allowed to change your lineup and swap out the new alternate player if you want, but only up until the first game starts. How will I see my current score? 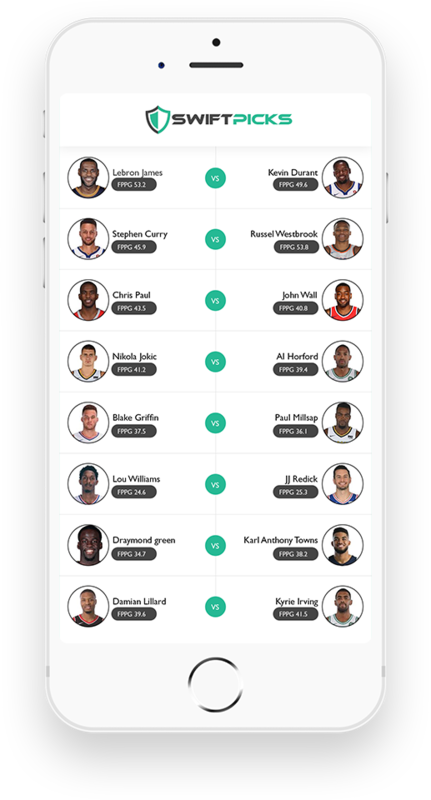 There will be live updates on each of the games that will provide real time scoring for each of your lineups. 2019 Swiftpicks All Rights Reserved.